Today, March 31st, really seemed like a turning point in the transition from winter to spring. 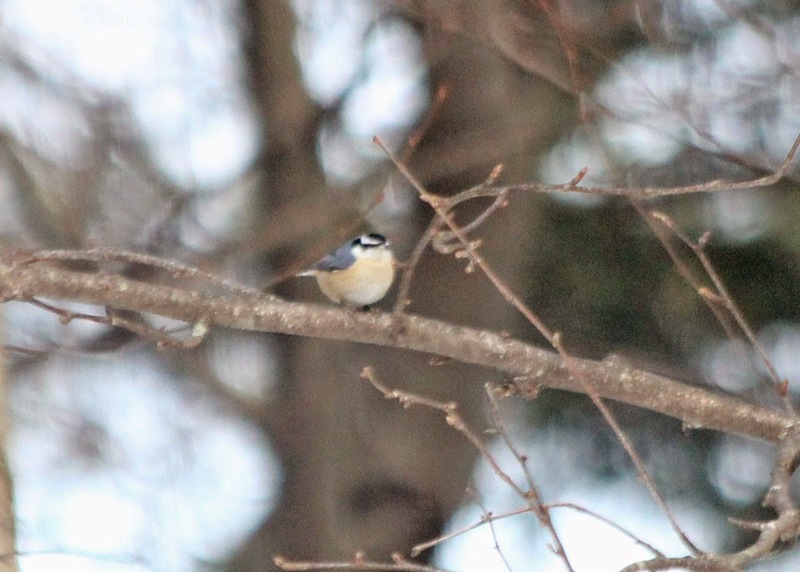 At least in the Gill/Turner's Falls area, the air was full of bird song with some real and obvious signs of migration to boot. I paid a couple of visits to Barton Cove, morning and late afternoon, and had new birds on both visits. 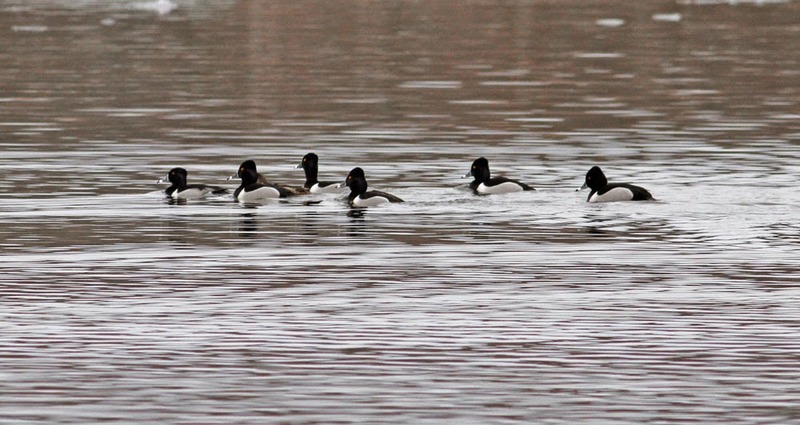 Most obvious was the returning waterfowl building up to over 70 Ring-necked Ducks in late afternoon along with 7 Bufflehead and numerous Common and Hooded Mergansers, and Common Goldeneye. In the morning I also managed to add Mark Lynch and Shiela Carroll to my local year list and they very kindly put me onto the first Wood Ducks of the season. I could only muster 6 Wood Ducks but Mark and Sheila had a whopping 22 birds! American Black Ducks too have arrived with 7 yesterday and 10 this morning along with the first Gadwall (2) of the season. 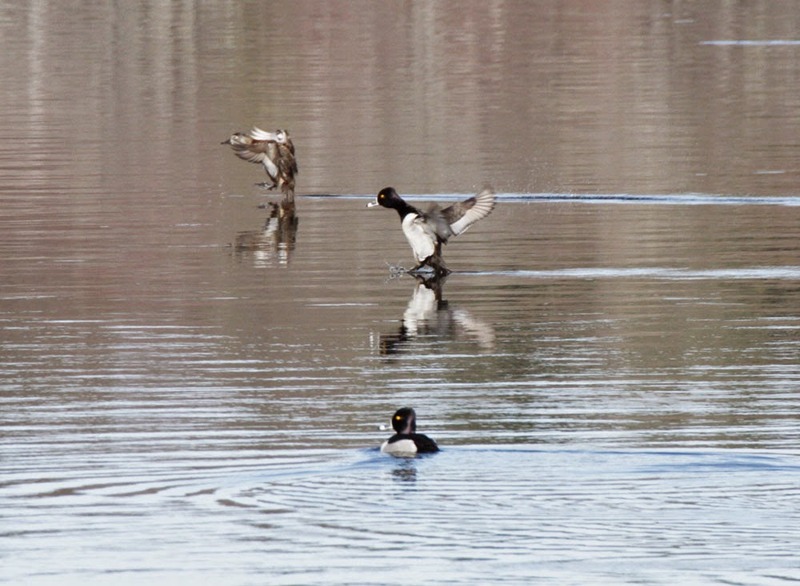 Ring-necked Ducks - some of the 70 present, Barton Cove, Gill, Franklin Co., MA. March 31st, 2015. 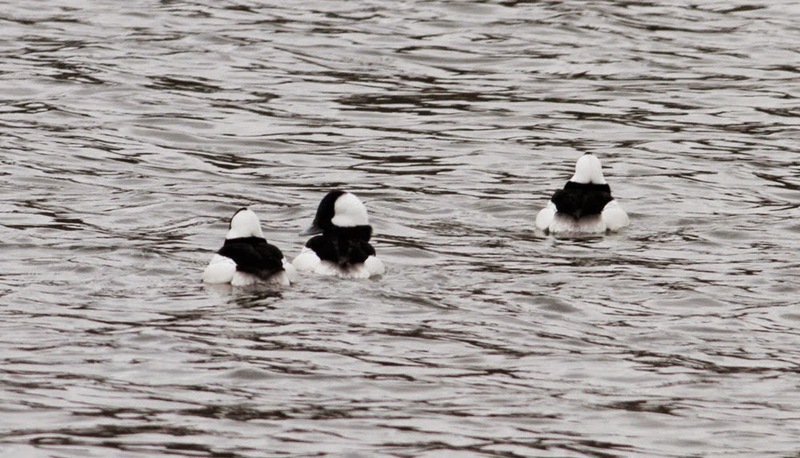 Buffleheads - Barton Cove, Gill, Franklin Co., MA. March 31st, 2015. 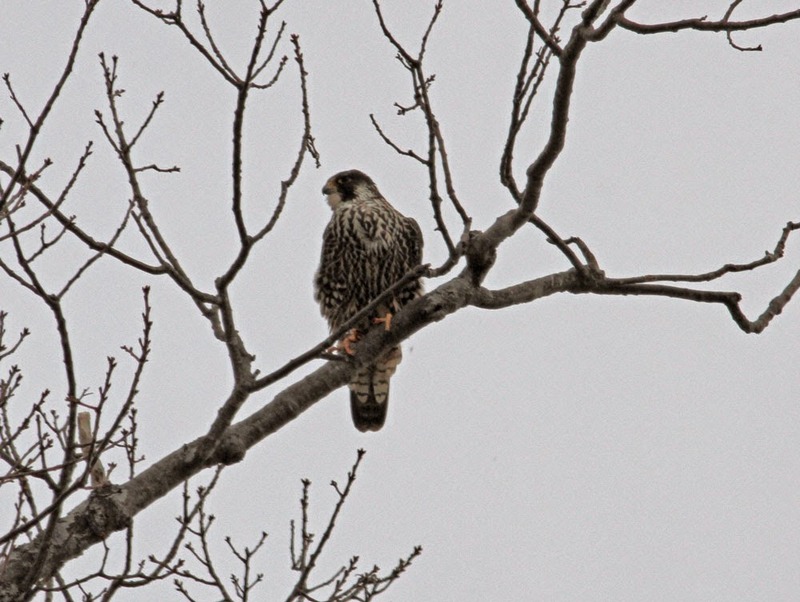 Peregrine - young bird by the Great Falls Discovery Center, Turner's Falls, March 30th, 2015. But it was the goose and gull migration that really captivated my imagination today. Throughout the morning, and actually throughout yesterday morning, small but frequent flocks of Canada Geese migrated northwards. 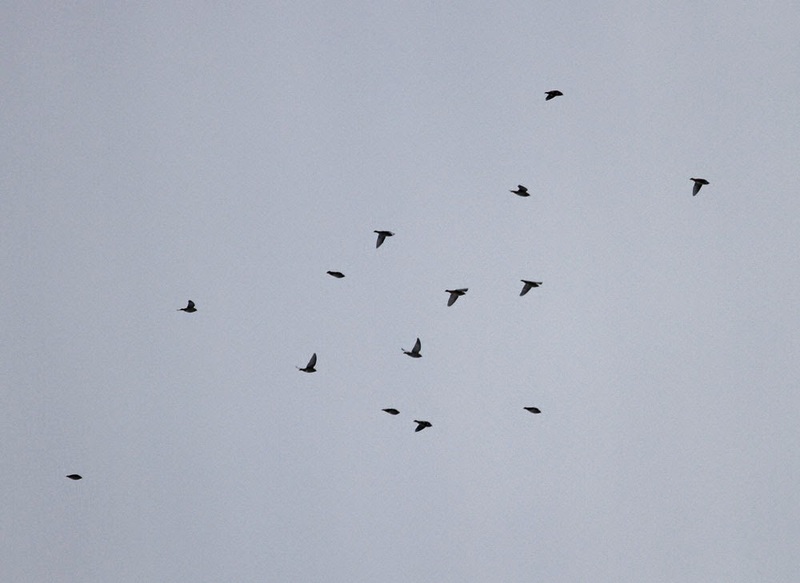 The numbers were not huge but the consistency of the flocks was impressive. 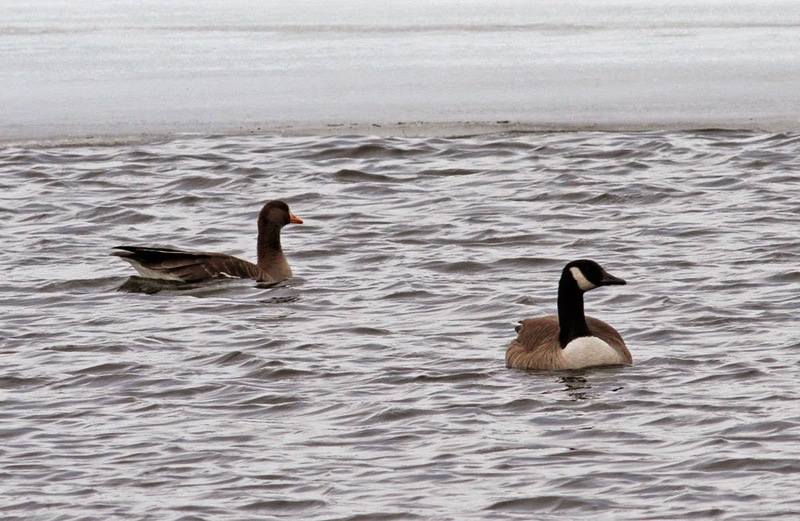 In late afternoon, a small grounded flock of Canadas at Turner's Falls contained a Greater White-fronted Goose. 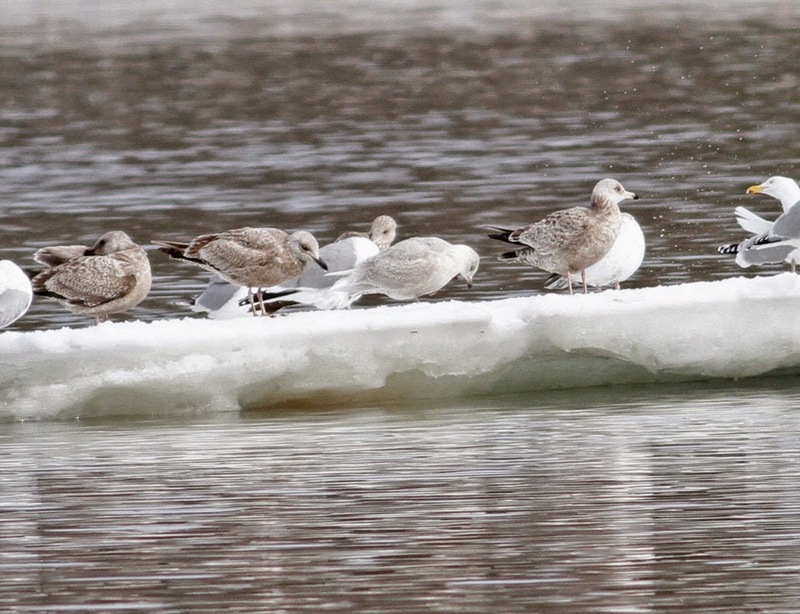 The ice flows held some impressive flocks of gulls in a broad scatter across Barton Cove with at least 700 gulls present by late afternoon. It ended up being a fine day for Lesser Black-backed Gulls with a pristine adult and a first-cycle in the morning, and an additional first-cycle bird in the afternoon. 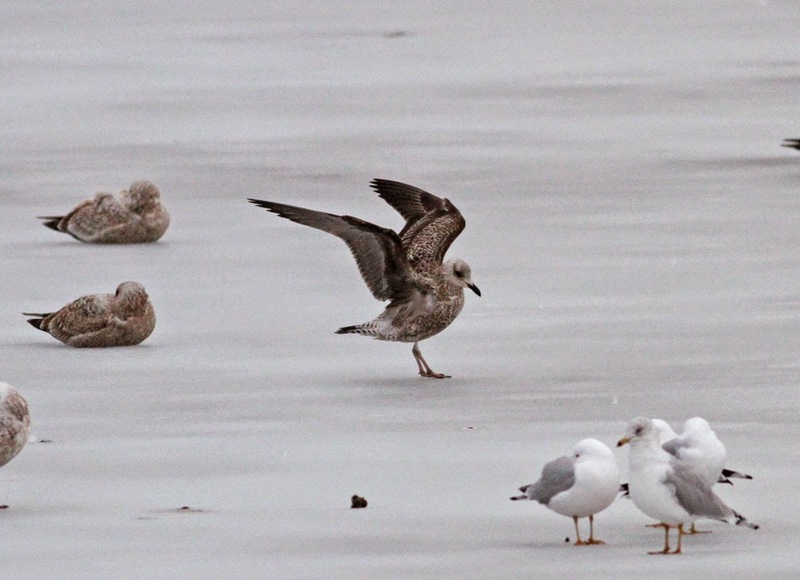 Great Black-backed Gulls were also up on previous visits with over a dozen passing through today, and there was a nice pale first-cycle Kumlien's Iceland Gull in the morning as well. Greater White-fronted Goose (left) - Unity Park, Turner's Falls, Franklin Co., MA. March 31st, 2015. 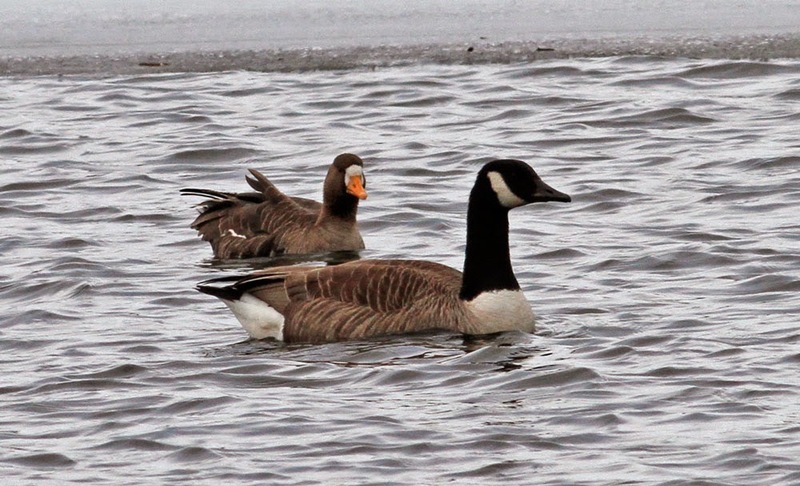 Greater White-fronted Goose (right) - Barton Cove, Gill, Franklin Co., MA. March 31st, 2015. Same bird as above but resting on the Gill side of the river. 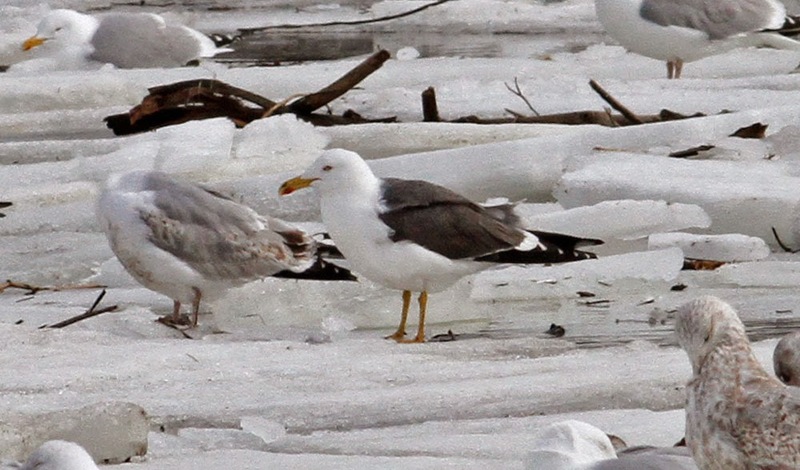 Lesser Black-backed Gull (adult/near adult) - Unity Park, Turner's Falls, Franklin Co., MA. March 31st, 2015. 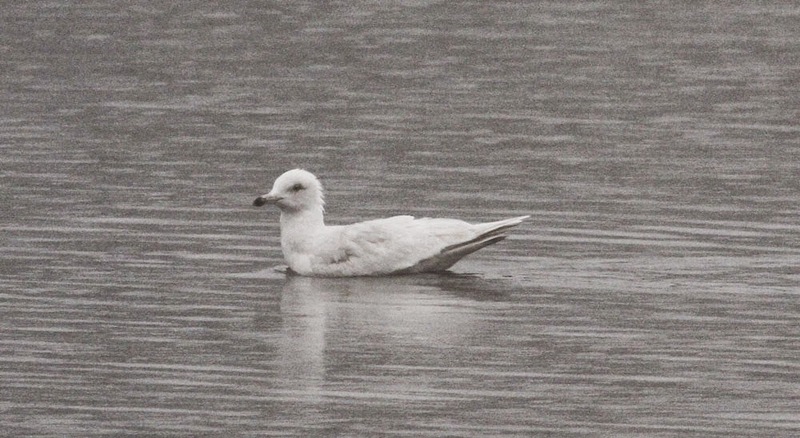 Kumlien's Iceland Gull (first-cycle) - Unity Park, Turner's Falls, Franklin Co., MA. March 31st, 2015. Funny to think of 39 deg F as 'spring-like' but it actually felt warmer than that this morning. 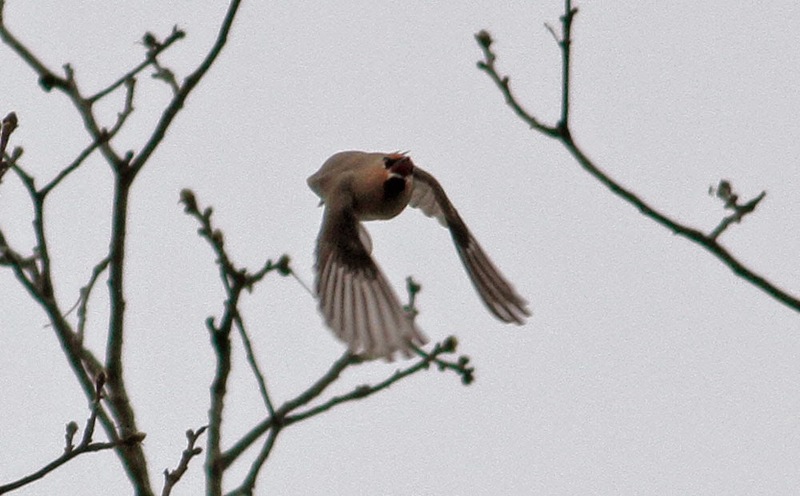 The roads around Gill were absolutely full of bird song with Common Grackles, Red-winged Blackbirds, Eastern Bluebirds, Dark-eyed Juncos and American Tree Sparrows all over the place. A few American Robins have started to appear including the first 'black-backed' male of the season. This morning was especially notable for singing Fox Sparrows with two heard along North Cross Road and another along Main Road near Upinngil Farm. It was also great to see my first migrant Canada Geese (250) heading north over Gill without stopping, and equally great to hear Killdeers displaying along Boyle Road, Gill. 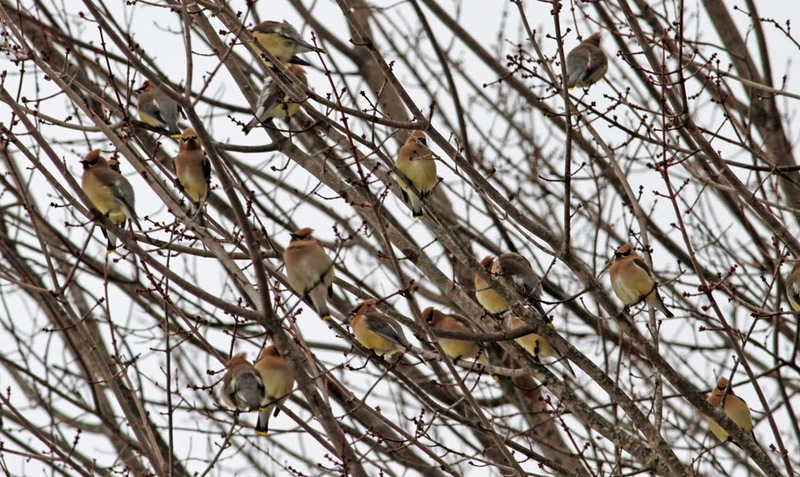 There was also a nice approachable flock of 42 Cedar Waxwings on North Cross Road though, for this morning at least, no Bohemians among them. 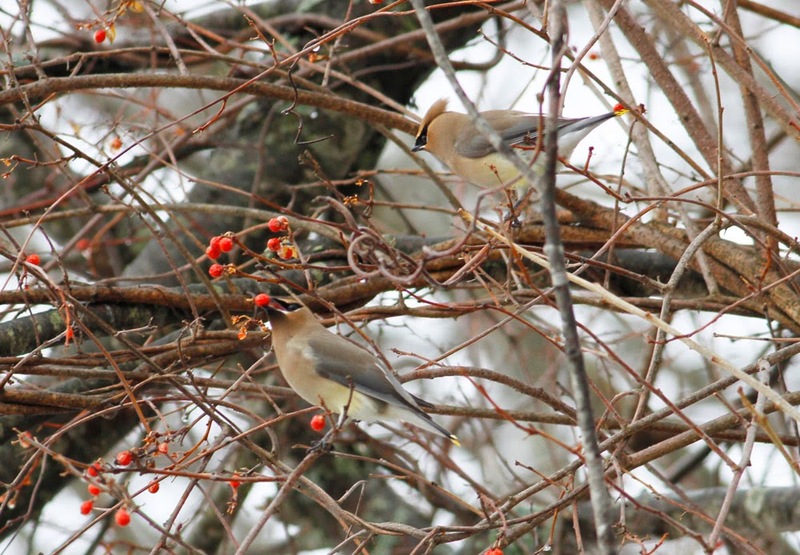 Cedar Waxwings - North Cross Road, Gill, Franklin Co., MA. March 27th, 2015. In the afternoon, I made a quick check of the rapidly receding ice at Barton Cove hoping for a few early season swallows but had no such luck. 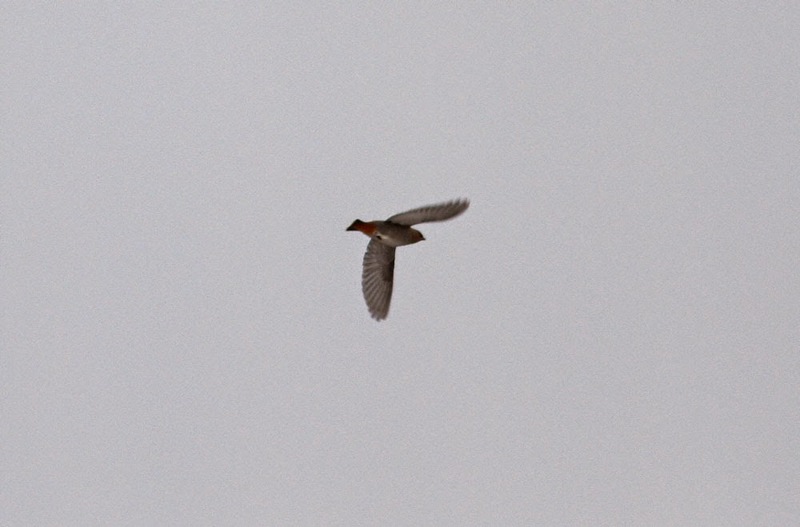 Two drake Green-winged Teals were present however, one a Unity Park and another way out on the ice completely alone. 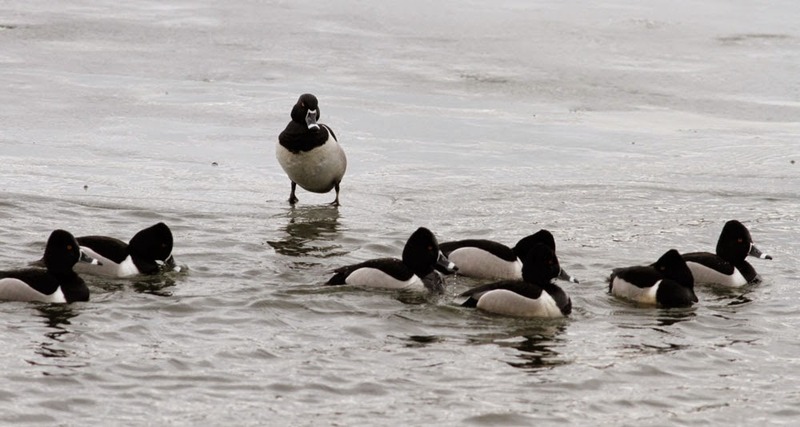 The Ring-necked Duck flock at Turner's Falls power canal had swollen to 37 birds. 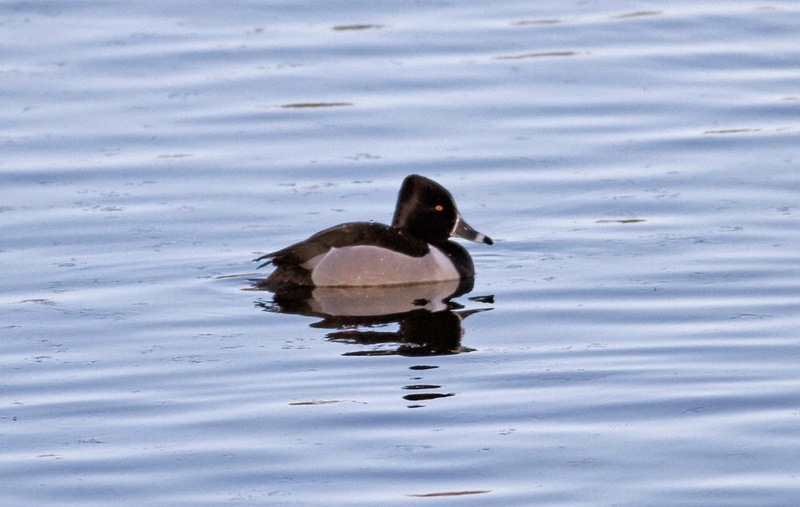 Common and Hooded Mergansers, and Common Goldeneyes continue there. And a couple more season firsts in the form of a Great Blue Heron at the power canal and a calling Fish Crow on Main Street, Greenfield. Ring-necked Ducks - Turner's Falls power canal, Franklin Co., MA. March 27th, 2015. Some of the 37 birds present on the power canal this afternoon. On Monday I topped up the nyjer seed feeders having neglected them for a bit whilst I was in Florida. The chickadees and juncos found the seed straight away but the Pine Siskins and American Goldfinches only discovered the new seed two days later. Really good numbers of Pine Siskins (35-100) have been feeding around North Cross Road, Gill about one mile to the south of us so hopefully the feeders will start pulling some of those birds into our yard. No sign of any redpolls thus far. The warmer air has finally arrived bringing plenty of rain this afternoon. A quick drive around Turner's Falls was pretty quiet but did show a continuing build of Ring-necked Ducks (3 on the 22nd, 7 on the 24th and now 14 on the 26th). 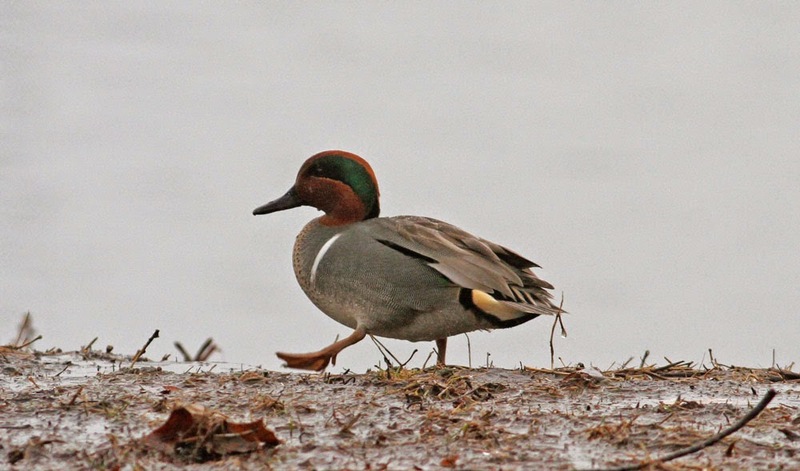 A fine drake Green-winged Teal appeared to be a new arrival hanging out with the Mallards at Unity Park where the very pale second-cycle Kumlien's Iceland Gull continued. 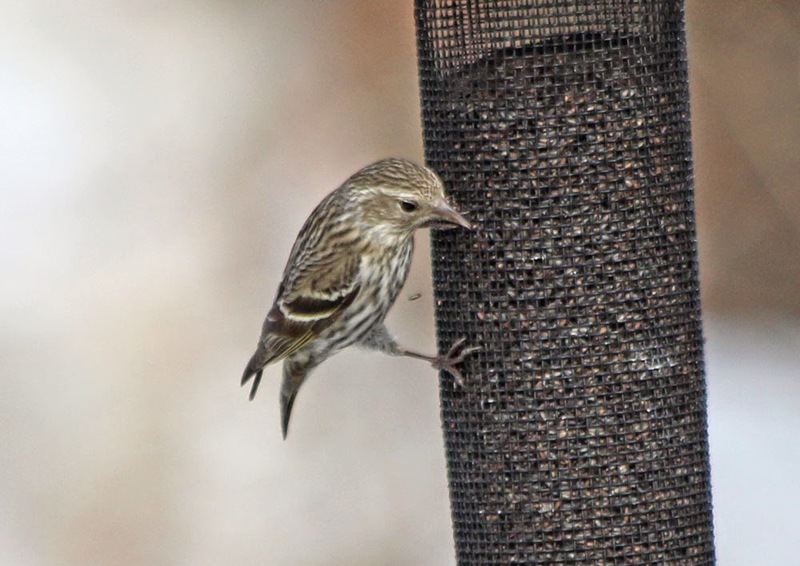 Pine Siskin - Northfield yard, Franklin Co., MA. March 25th, 2015. Green-winged Teal - male, Unity Park, Turner's Falls, Franklin Co., MA. March 24th, 2015. Kumlien's Iceland Gull - second-cycle, Unity Park Turner's Falls, Franklin Co., MA. March 26th, 2015. 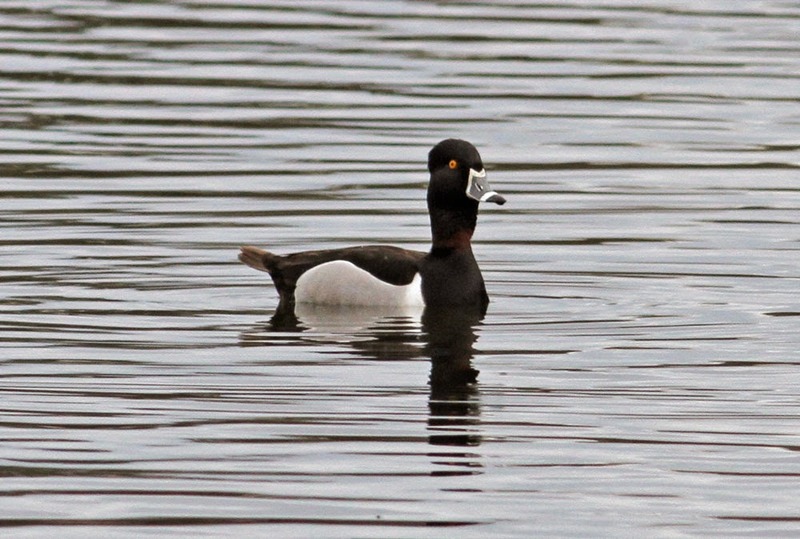 Ring-necked Duck - male, Unity Park, Turner's Falls, Franklin Co., MA. March 24th, 2015. Ring-necked Ducks - Turner's Falls power canal, Franklin Co., MA. March 24th, 2015. Ring-necked Ducks - part of a group of 14, Turner's Falls power canal, Franklin Co., MA. March 26th, 2015. Well another morning below 20 deg F left me feeling a bit despondent but I probably should have known better. The volume of bird song along North Cross Road in Gill was enough to suggest that spring-like changes were on the way. At lunch time, the squat shape of a Red-breasted Nuthatch caught my eye through the kitchen window - certainly a yard first and all the more remarkable considering that 2014 was a relatively poor autumn and winter for this irruptive species. It didn't linger and I thought I'd lost the opportunity for an image but it reappeared in the middle of the afternoon. With my old Canon Rebel by the window I was able to snap a couple of record shots before it disappeared once more. 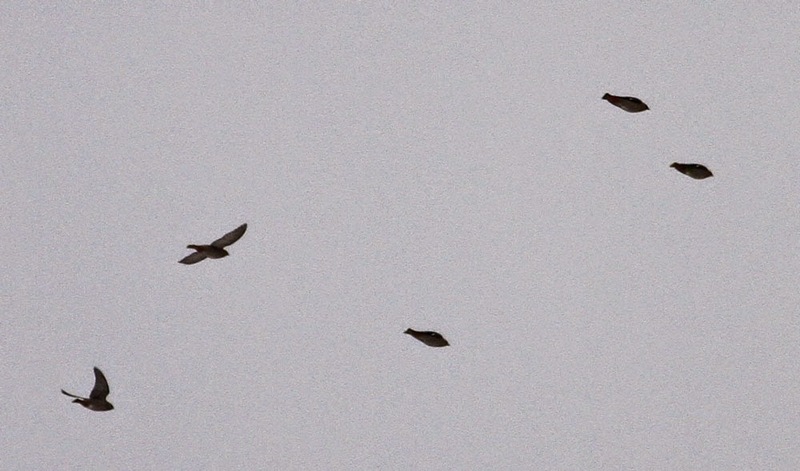 In the same moment, another season first for our Northfield yard - a Turkey Vulture overhead . Red-breasted Nuthatch - Northfield yard, Franklin Co., MA. March 24th, 2015. Saturday evening provided me with half an hour to check on the gull situation at Turner's Falls. Conditions were perfect. It was windless with complete cloud cover, and rather warmer and more spring-like than most recent evenings. 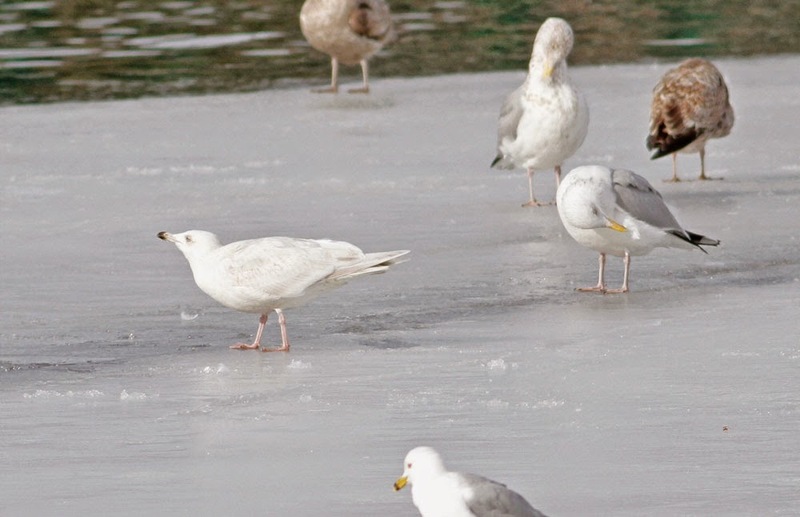 On arrival at Unity Park I was greeted by a cacophony of sound with a nice mass of vocalizing gulls spread over the ice. Most of them were Ring-billed Gulls resplendent in breeding condition, indeed so many were present it looked like an incursion of north bound migrants had taken place. On the other hand, relatively few large gulls were present but Kumlien's Iceland Gull were still around in decent numbers (seven in total). Of these, six birds were close together forming a loose flock with the only adult Kumlien's choosing to rest in among the Ring-billed Gulls. 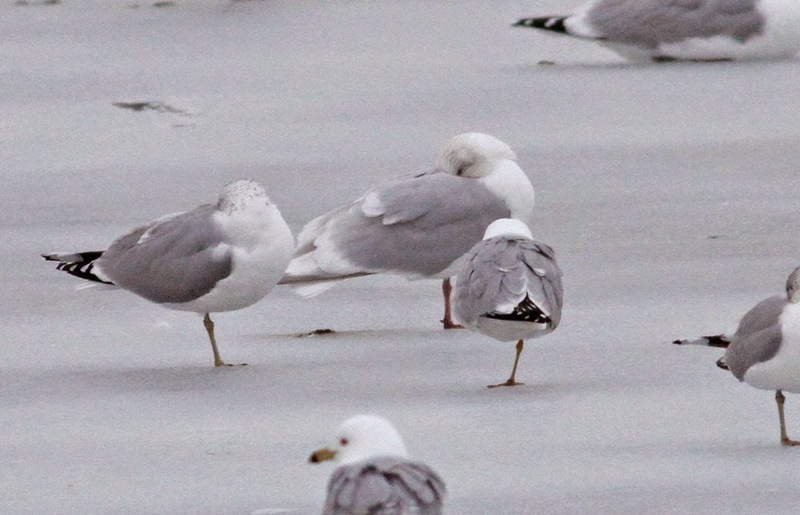 After a bit more sorting, the only other unusual gull I could find was a Lesser Black-backed Gull, this one a first-cycle, and actually an age-class that I don't find too frequently at Turner's Falls. Kumlien's Iceland Gulls - six together (group of four left, first-cycle right, third-cycle extreme right), Unity Park, Turner's Falls, Franklin Co., MA. March 21st, 2015. Kumlien's Iceland Gulls - five together (group of three left, second-cycle right, first-cycle extreme right), Unity Park, Turner's Falls, Franklin Co., MA. March 21st, 2015. 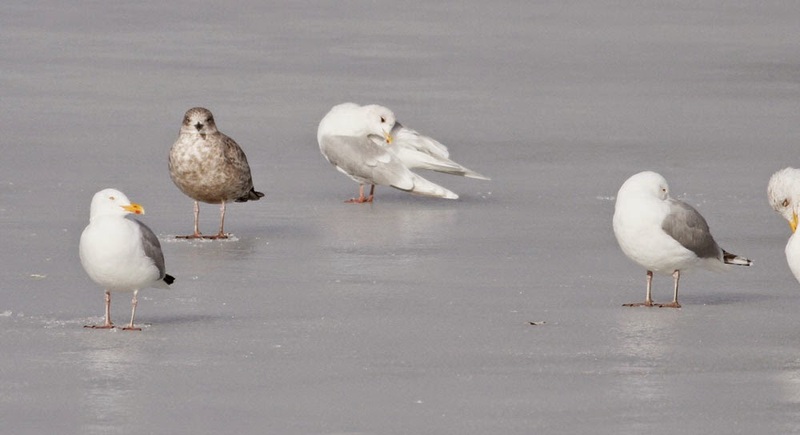 Kumlien's Iceland Gulls - four together (third-cycle extreme right), Unity Park, Turner's Falls, Franklin Co., MA. March 21st, 2015. 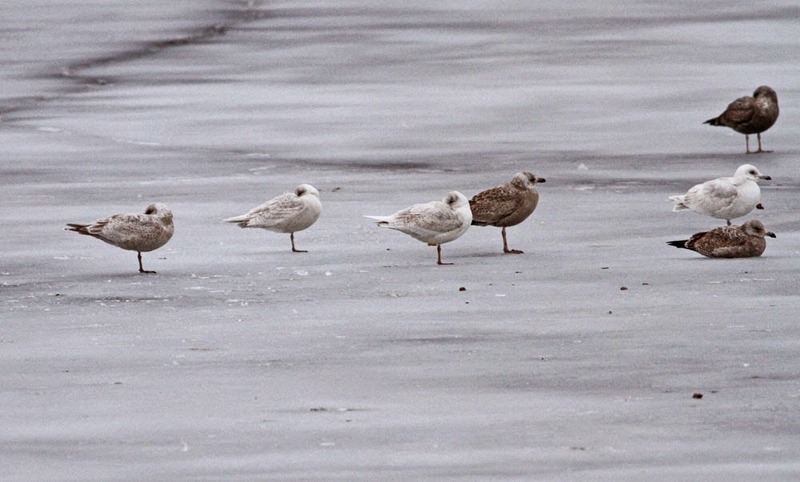 Kumlien's Iceland Gulls - four together (first-cycles right, second-cycle extreme right), Unity Park, Turner's Falls, Franklin Co., MA. March 21st, 2015. 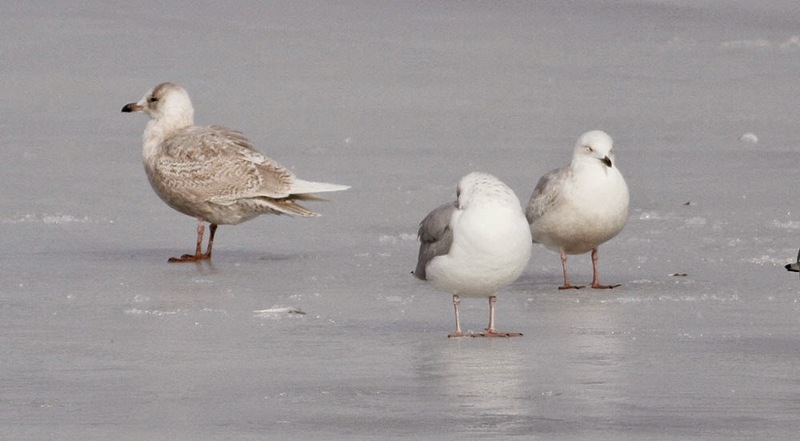 Kumlien's Iceland Gull - adult (center), Unity Park, Turner's Falls, Franklin Co., MA. March 21st, 2015. Lesser Black-backed Gull - first-cycle center of both images, Unity Park, Turner's Falls, Franklin Co., MA. March 21st, 2015. 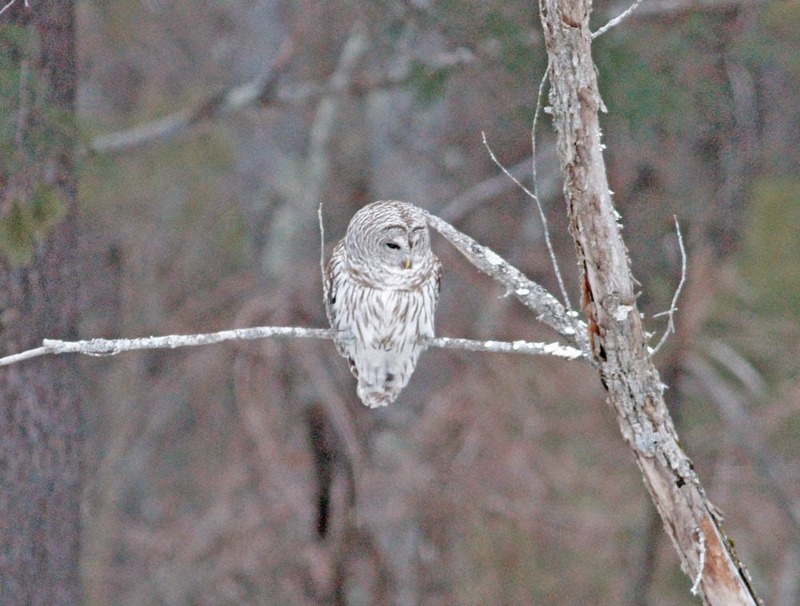 On the way home through Gill, a pale, perched owl close to Main Road gave a few heart pounding moments until it ultimately proved to be Barred Owl foraging out in the open. It was just a 100 meters down the road from the site of the 1973 Great Gray Owl in Gill, a bird that's always at the back of my mind whenever I drive passed that spot! 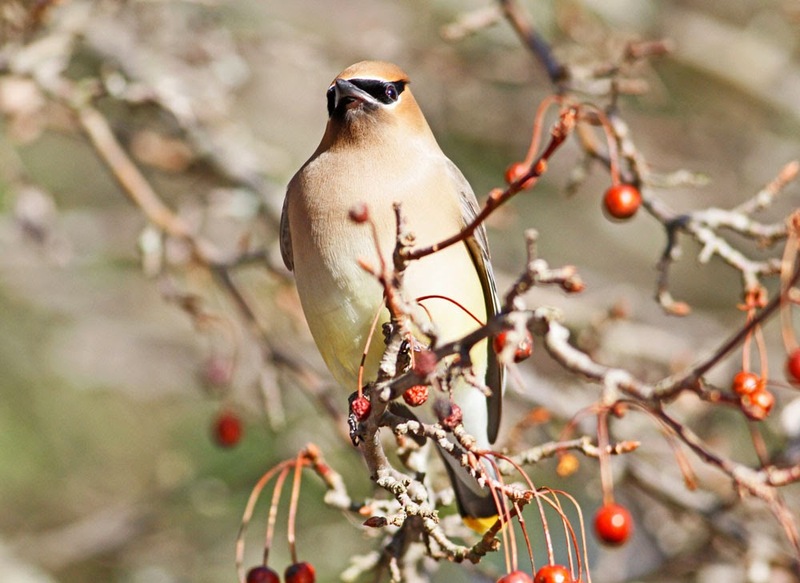 Continuing this morning's waxwing theme, I encountered a nice close group of Cedar Waxwings in Unity Park, Turner's Falls this afternoon. Only a dozen or so were present and I left feeling comfortable that no Bohemians were mixed within the group. 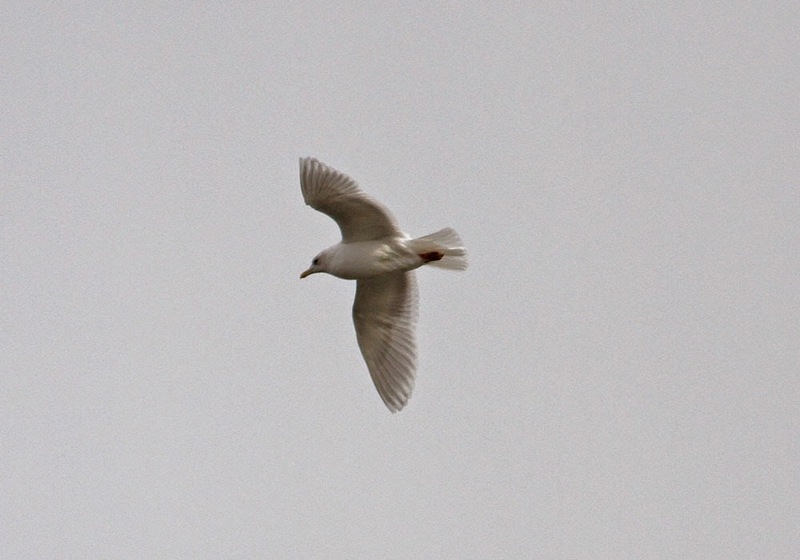 Otherwise, very few gulls compared to yesterday evening and no pale-winged birds at all. MA - Bohemians come to Gill! 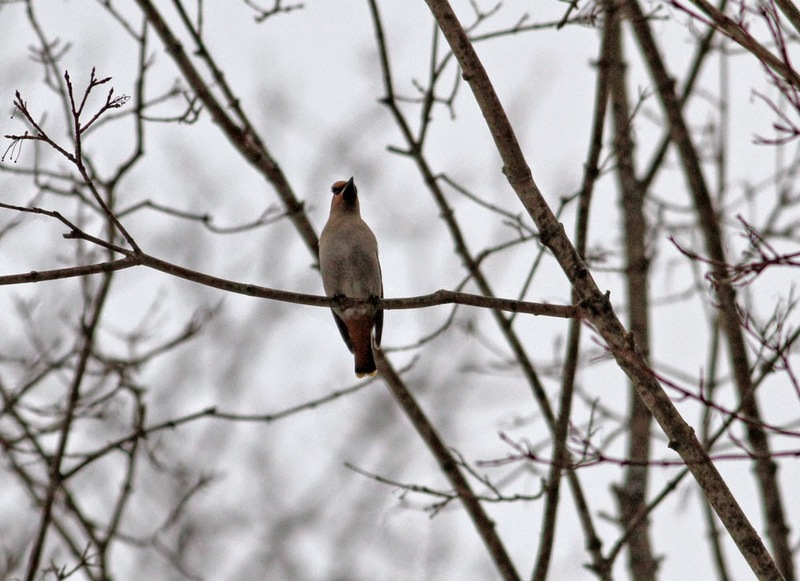 During my morning run in Gill I heard the bright, ringing calls of a Bohemian Waxwing on North Cross Road. 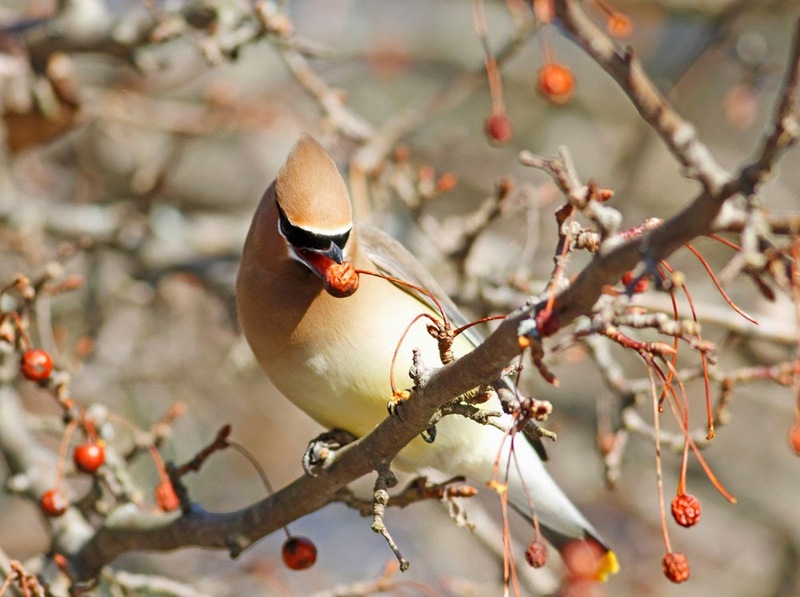 I returned thirty minutes later armed with bins and camera and was delighted to relocate it loosely associating with a group of about 15 Cedar Waxwings foraging on Oriental Bittersweet. 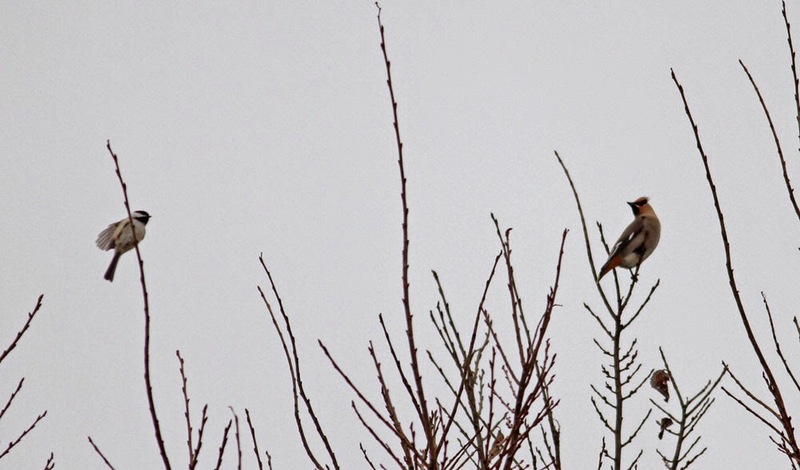 I watched the Bohemian for a little while before it suddenly lifted up and joined a flock of about a dozen passing waxwings (silent) which I assumed to be part of the same group of Cedars seen earlier. As the lone bird joined the flock I mentally noted that there didn't appear to be much of a size difference between the lone bird and the group. 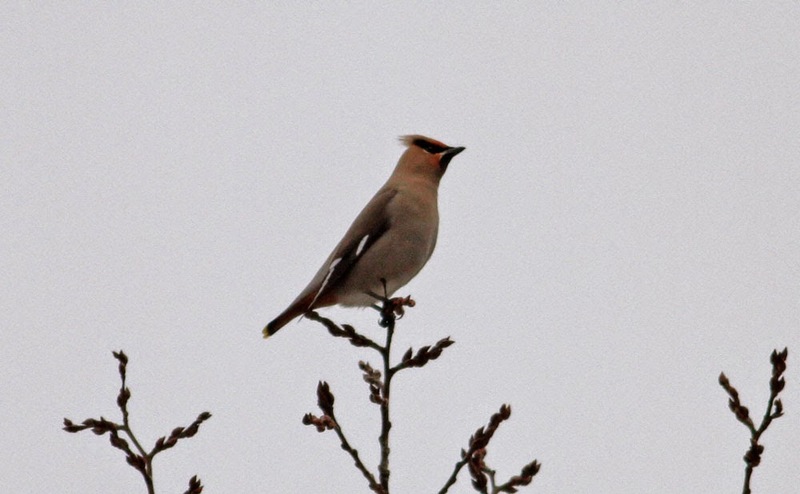 When I looked at the photos at home, the whole group showed the diagnostic chestnut undertail coverts of Bohemian Waxwing......fourteen of them in all!! 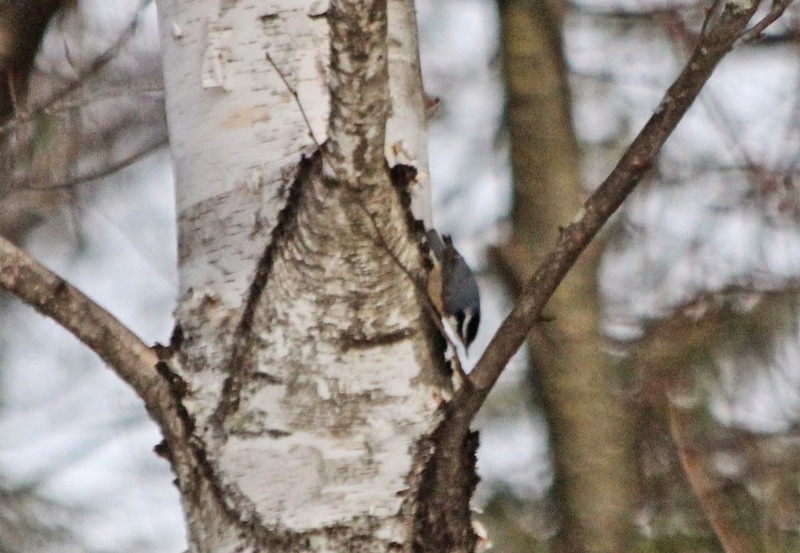 Once again, North Cross Road proved very birdy this morning with Common Grackle, Hermit Thrush, a dozen Eastern Bluebirds, 45 Pine Siskins and lots of songsters including Dark-eyed Juncos and American Tree Sparrows. 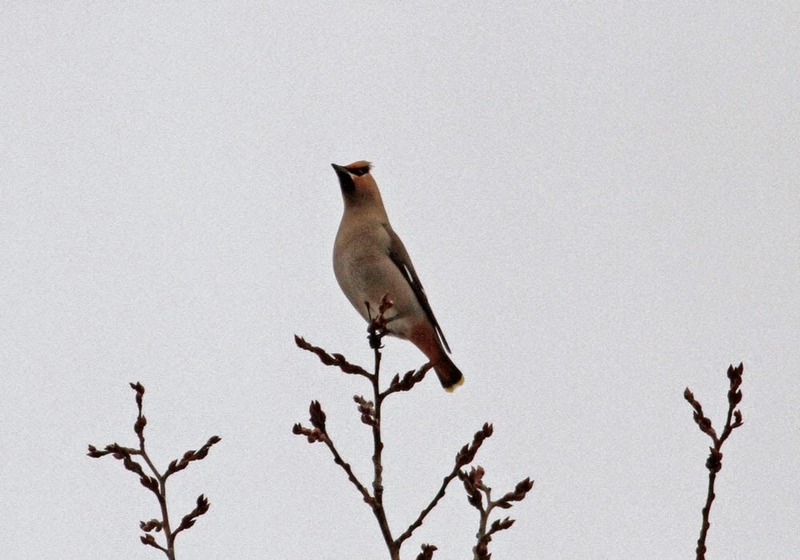 Bohemian Waxwings - North Cross Road, Gill, Franklin Co., MA. March 17th, 2015. Had a lovely spring-like evening at Turner's Falls. 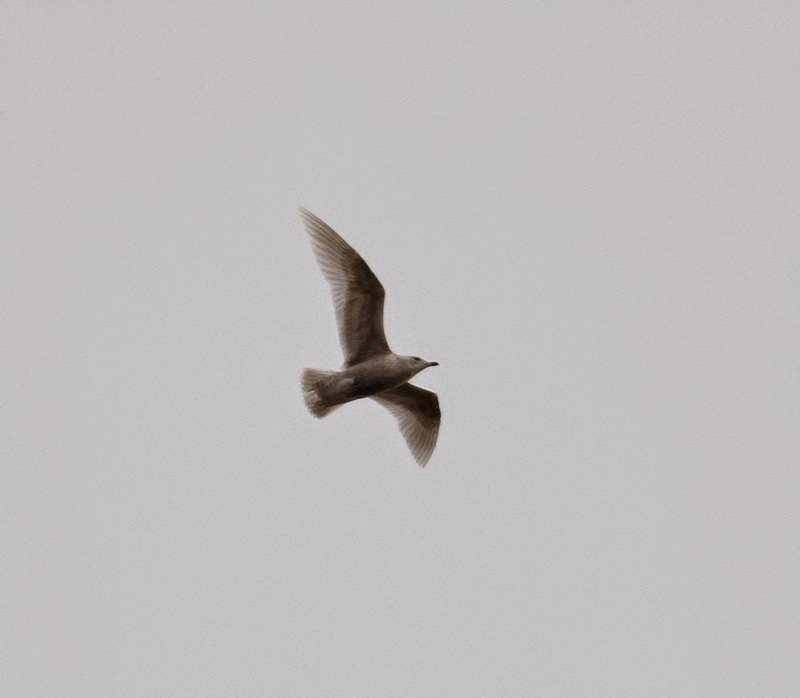 Rather small numbers of gulls but enough to dig out four Kumlien's Iceland Gulls and another white-winged gull that I was initially less certain about. 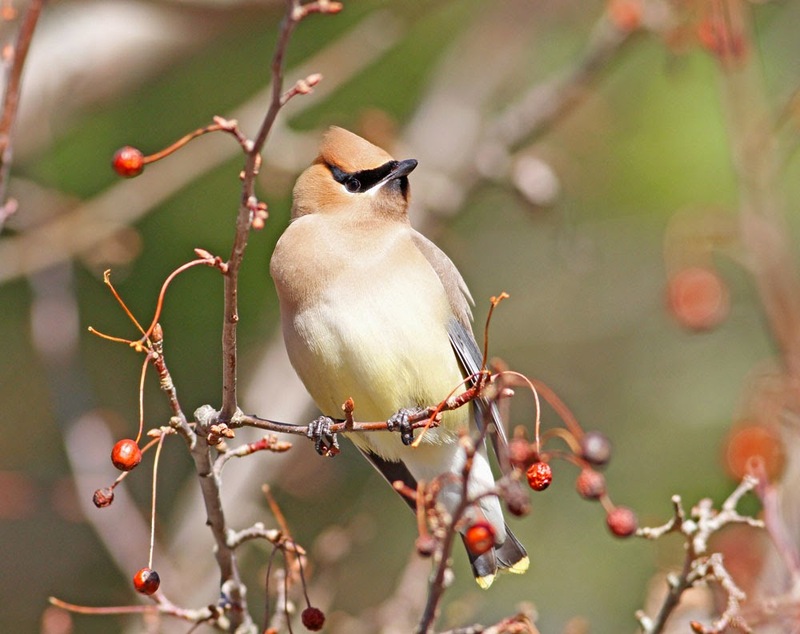 Elsewhere, North Cross Road in Gill has been quite lively lately with up to 100 Pine Siskins and 45 Cedar Waxwings, as well as FOY Red-winged Blackbirds and Brown-headed Cowbirds. Turkey Vultures already seem quite widespread with singles in Gill, Turner's Falls and four together in downtown Greenfield. Springtime at last. Kumlien's Iceland Gull - adult, Turner's Falls, Franklin Co., MA. March 16th, 2015. 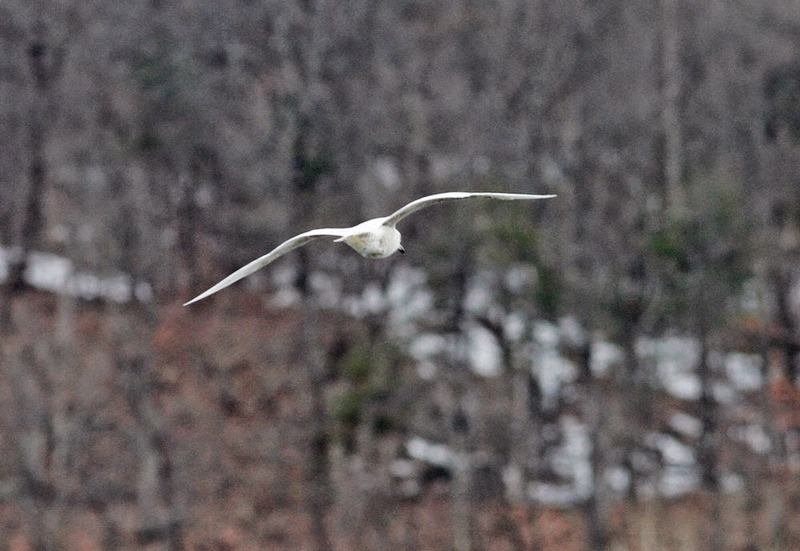 Kumlien's Iceland Gull - first-cycle, Turner's Falls, Franklin Co., MA. March 16th, 2015. 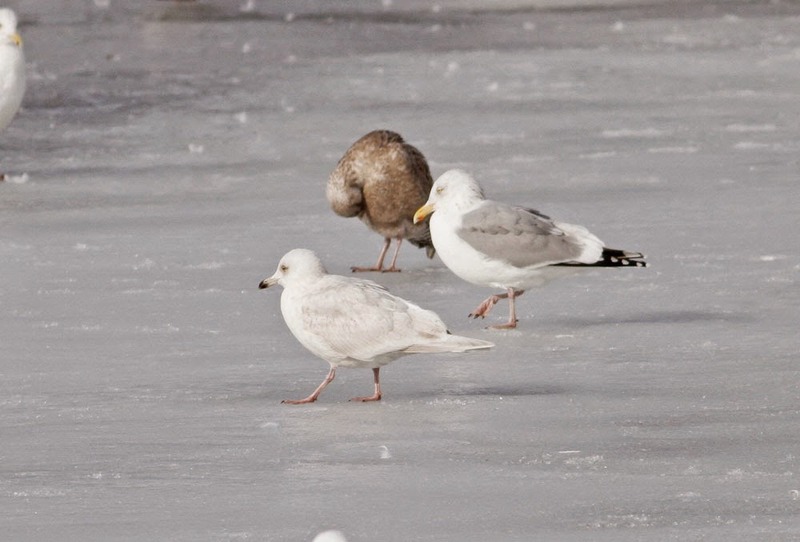 Kumlien's Iceland Gulls (left and right) - first-cycles, Turner's Falls, Franklin Co., MA. March 16th, 2015. 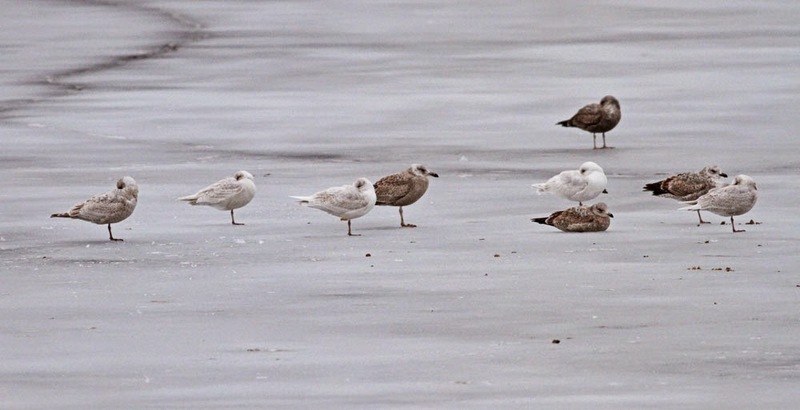 Kumlien's Iceland Gull (center) - first-cycle, Turner's Falls, Franklin Co., MA. March 16th, 2015. 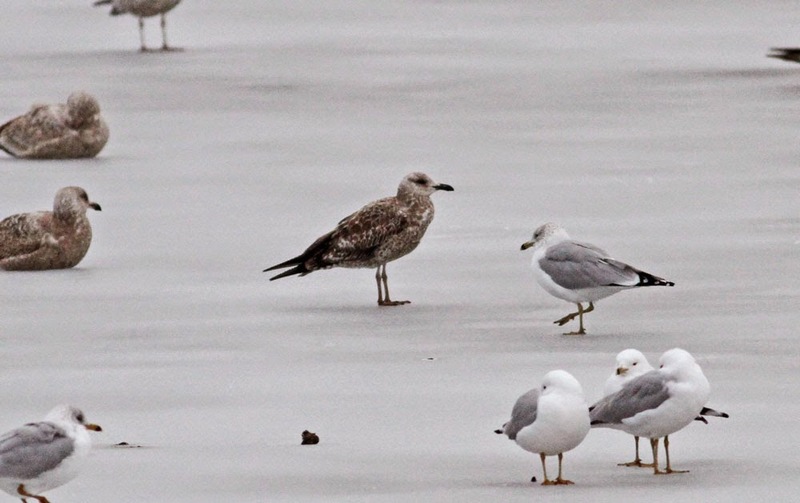 Kumlien's Iceland Gull (center) - second-cycle, Turner's Falls, Franklin Co., MA. March 16th, 2015.
indicated heavily that it was another Kumlien's Iceland Gull bringing the evening's tally to five birds - not too shabby! 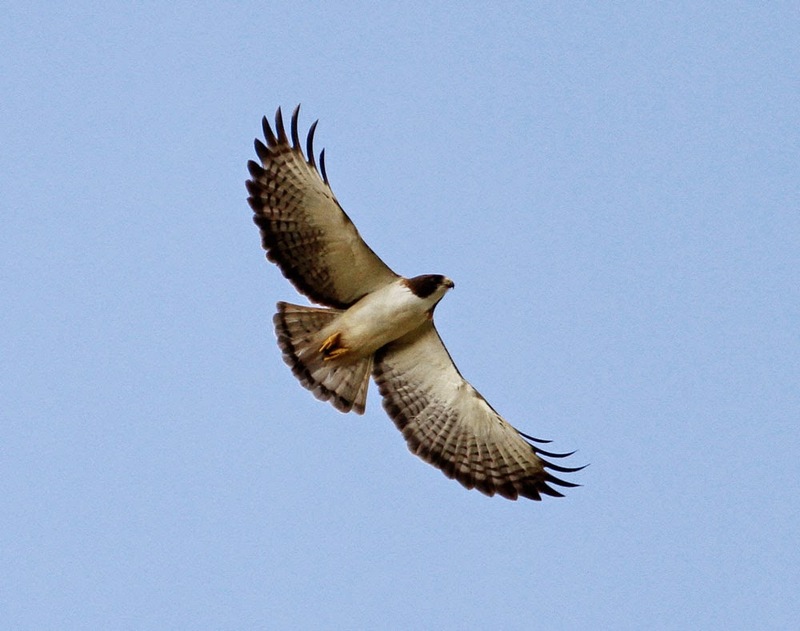 Short-tailed Hawk - light morph, Kenansville, March 10th, 2015. 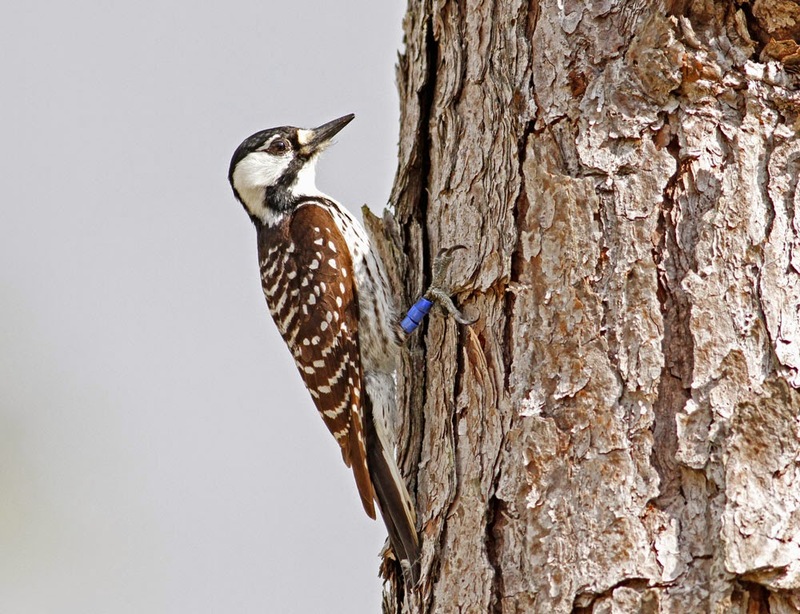 Red-cockaded Woodpecker - Three Lakes WMA, March 10th, 2015. 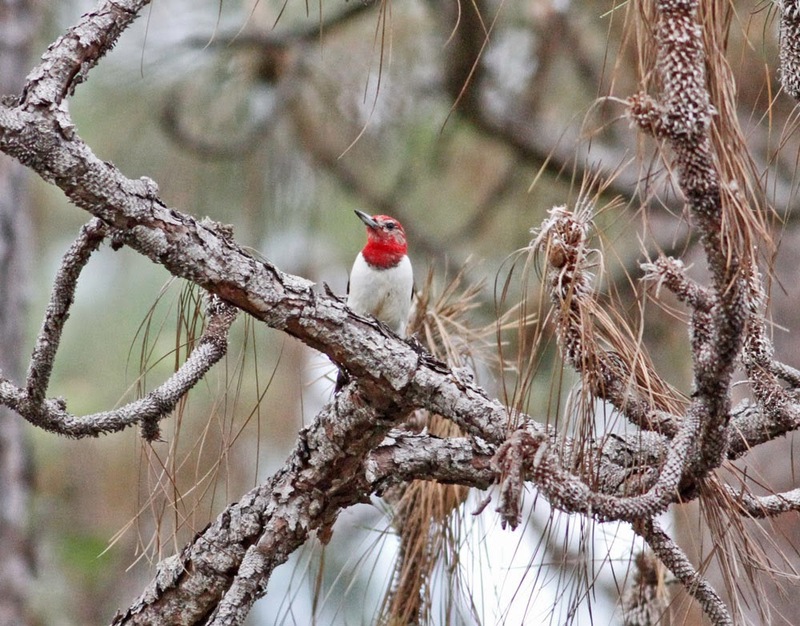 Red-headed Woodpecker - Three Lakes WMA, March 10th, 2015. 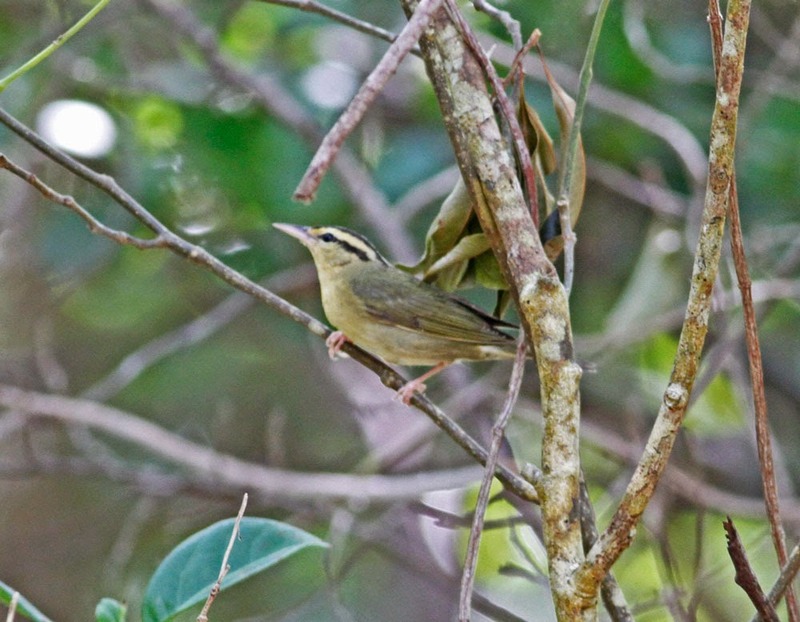 Worm-eating Warbler - Key Largo, March 3rd, 2015. 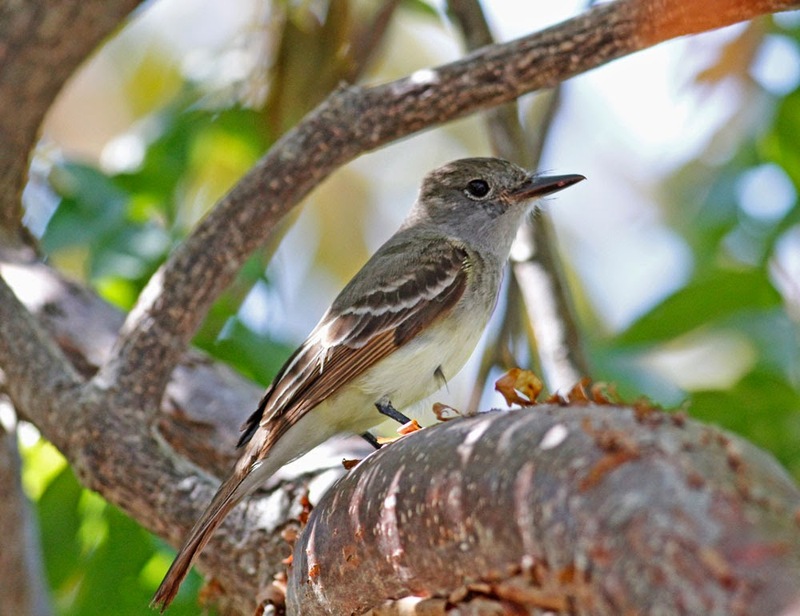 Brown-crested Flycatcher - Bahia Honda Key State Park, March 1st, 2015. 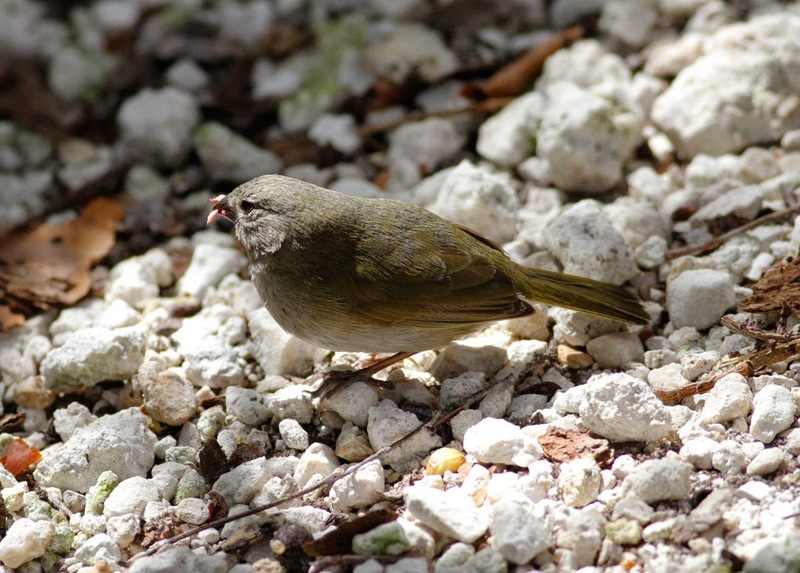 Black-faced Grassquit - Bahia Honda Key State Park, March 1st, 2015. 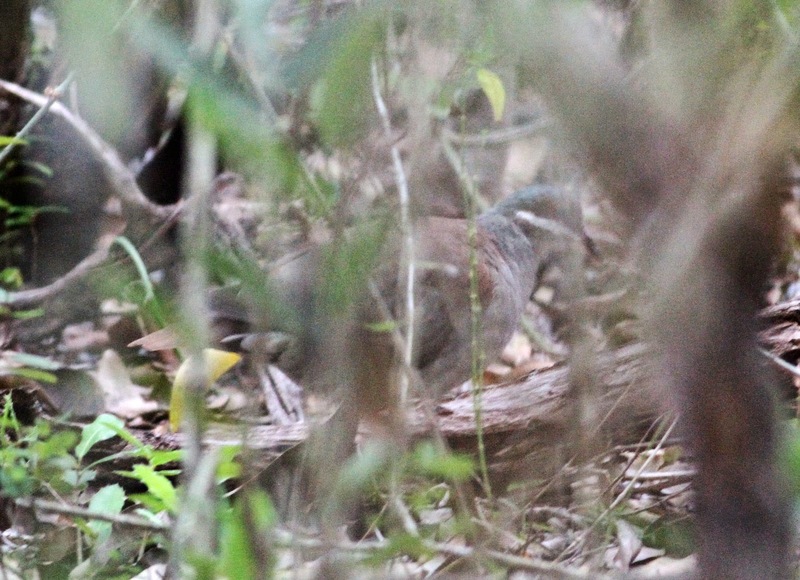 Key West Quail-dove - Long Key State Park, March 1st, 2015. 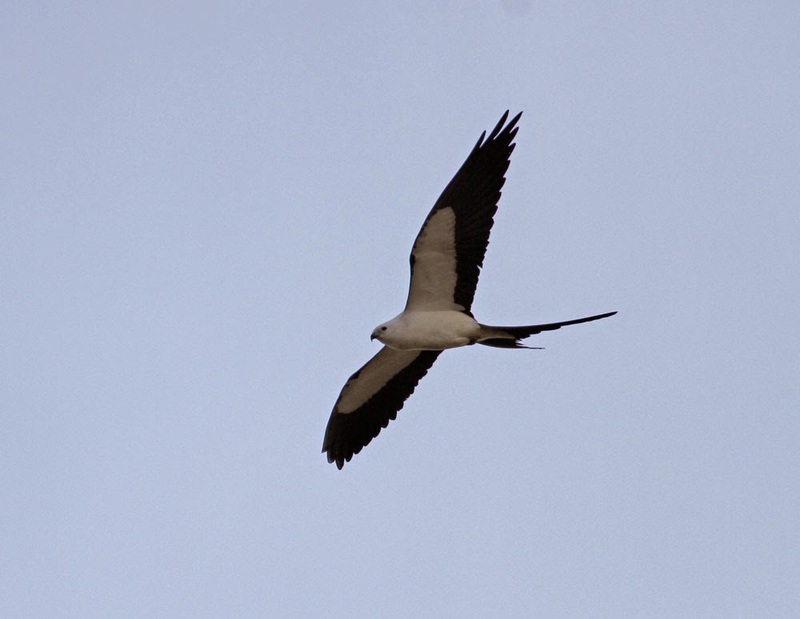 Swallow-tailed Kite - Kenansville, March 10th, 2015. 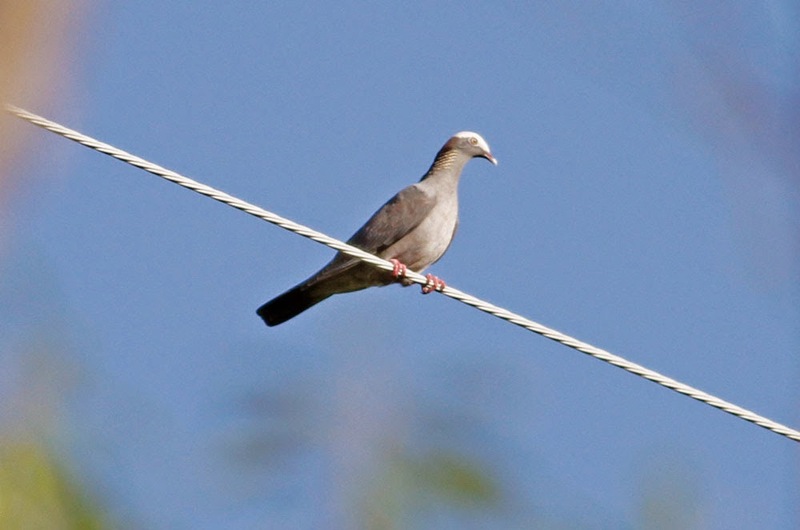 White-crowned Pigeon - Key Largo, March 3rd, 2015.